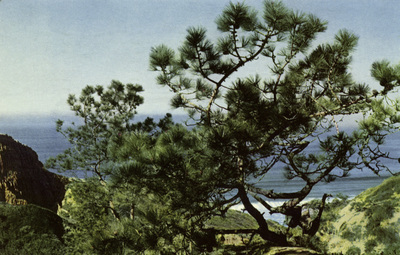 "California – Torrey Pine, San Diego"
Torrey Pine, near San Diego, California, is rarest of all known pines. Native only to San Diego County and Santa Rosa Island, these weird trees which when growing by the sea are bent by the wind into low and tortuous shapes, grow straight-limbed if protected. One color postcard with a divided back. The postcard was published by Union Oil Company of California in Los Angeles, California.